Do you use a large number of stencils for your events and wish to bulk buy your stencils? 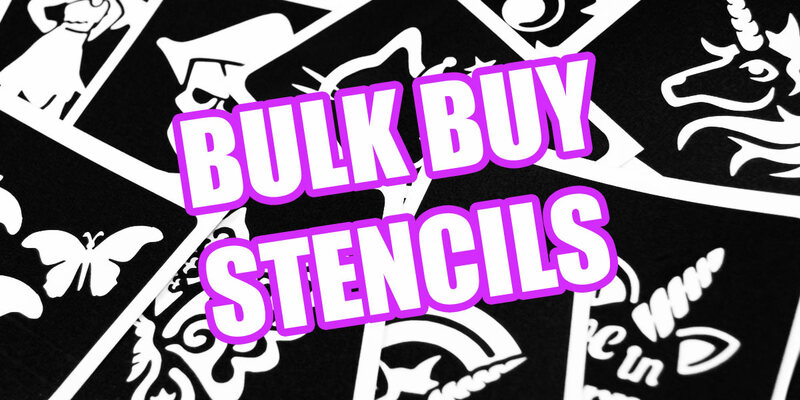 You can now purchase Glitter Body Art’s temporary tattoo stencils in bulk, and you will receive a discount on larger quantities. Please note: All of our stencil packs contain 5 sheets. Our STANDARD size stencils have 1 stencil design per sheet. Our MIDI stencils have 2 or 3 stencil designs per sheet. Our MINI stencils have 3 or 4 stencil designs per sheet. Our offer is perfect if you run your own Glitter Tattoo business and require high volumes of certain designed stencils i.e. Unicorn Glitter Tattoos or if you doing a Christmas event and require a lot of Christmas glitter tattoos. Our stencils are designed in-house at Glitter Body Art and come in three layers, except our mini stencil range where they are two layer stencils. There are over 400 tattoo designs ranging from butterflies stencils, unicorn stencils, dinosaur stencils and many more themes to suit all occasions. To buy multiple stencil packs, simply click the Plus and Minus buttons on each product page, or type in the amount of packs you want. Or if you are in a hurry & want to buy various designs, simply click the Add To Cart button while choosing your designs, then you can change the product quantity on the Cart page.